After we had the Beaujolais Nouveau debacle we still wanted wine of course so I went back downstairs and came up with this bottle. A simple $12 CdR that probably wouldn’t blow us away but also wouldn’t leave us wondering why us. colonelgrape: 71. Like I said previously this bottle was meant to be a filler of sorts. Not gonna wow you but not going to hurt you either. After working through the bottle I’ll say I wasn’t too pleased with it but I’ll give it the benefit of the doubt after sampling such awfulness with the Beaujolais Nouveau…I’ll say it was barely average. MobyGrape: 72. Definitely not my favorite Rhone, but I was told not to expect much from this one anyways. I’m not sure how accurately I can assess this one, after drinking something I disliked so much, I wasn’t going to give anything a fair shake. 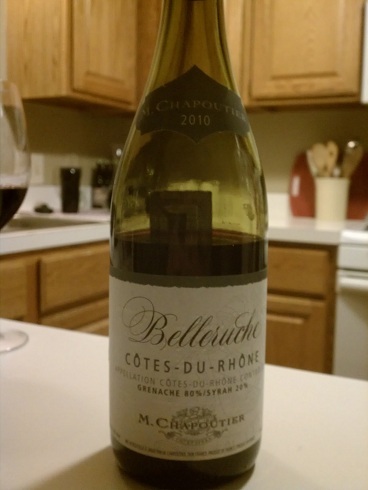 This entry was posted in Cotes du Rhone, France, Grenache, Mourvedre, Rhone, Syrah on November 30, 2012 by colonelgrape.